Epcon is a celebrated name in modular and industrial Batch Oven design and advanced thermal process applications with our vertically integrated 250,000 square foot manufacturing facility. From concept through factory acceptance testing, we fabricate and assemble every component in-house, and Epcon guarantees quality and performance of our modular and industrial Batch Ovens. Custom Batch Oven designs by Epcon are innovative, distinct, and versatile. 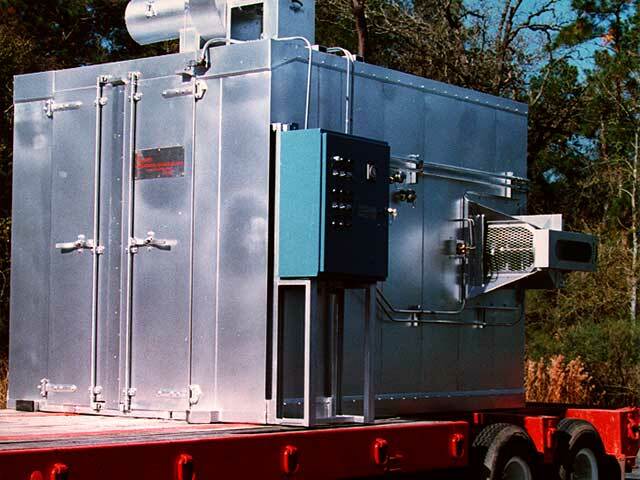 Direct, Indirect, Electric, Gas, or the alternate fuel of your choice, all available with integrated emissions compliance solutions, the team at Epcon creates energy efficient modular and industrial ovens that meet your operational and budget requirements. Batch Ovens are an ideal solution for aging, baking, curing, drying, finishing, heat treating, hardening, or pre-heating. Epcon has the technologies and capabilities to constantly innovate our industrial and modular Batch Ovens, while continuously working to improve our services, capabilities, and knowledge. Due to our in-house manufacturing, we can audit every industrial or modular Batch Oven, ensuring that it meets our high standards for design, function, and efficiency. We proudly take responsibility for each of our products, and expect our customers to always hold us accountable for our work. We guarantee a quick response to all of your modular and industrial Batch Oven needs without compromise. We can design a Batch Oven customized to your particular specifications. Epcon Industrial Ovens are renowned for their quality. We can accommodate any order for Batch Ovens, Drying Ovens, Curing Ovens, or Powder Coating Ovens. Each of Epcon’s Batch Ovens is built in compliance with OSHA and NFPA86 requirements and standards.